Expand your vocabulary and make a sophisticated addition to your desk or bookshelf with Aspinal's Oxford English Dictionary. Portably proportioned, it is ideal for both home and travel. Every dictionary reflects years of expertise in the traditional bookbinding techniques that are applied to the manufacturing process by our master craftsmen. The premium, hand bound leather covers imbue a distinguished air and can be further fine tuned with the addition of personalised initials or a name. Leather Oxford English Dictionaries from Aspinal of London are individually handmade in England in our own workshops by genuine leather and bookbinding master craftsmen and women. Each leather Oxford England Dictionary is made using only the best hand-dyed and hand waxed leather and age-old traditional bookbinding skills handed down through the generations. 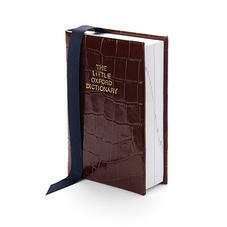 Hand bound in premium leathers in ivory, black or purple croc and complete with a ribbon page marker, the ninth edition of the Little Oxford English Dictionary is part of the range based on the Concise Oxford English Dictionary (11th edition). It provides clear up to date coverage of the core vocabulary of English and reflects how the language is really used today. Small enough to fit in a bag or briefcase, it is ideal for home, business travellers and students who require a straightforward, user friendly guide to the English language of today. 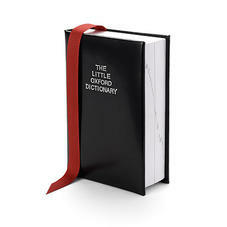 The Little Oxford English Dictionary is perfect for personalising with initials or name.